Its time again to renew passport but this time is for my mum's which is due on 18 May 2011. 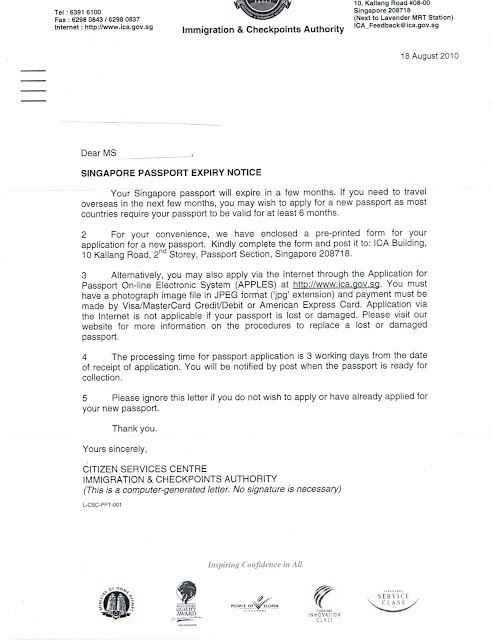 The ICA reminder letter arrived sometime on 20 August 2010 which is at least 9 months in advance. Maybe that's what PM Lee termed as good productivity. Planned to do it thru http://www.ica.gov.sg/ because its faster and S$10 cheaper (S$70). However as I do not have her NRIC Issue Date, have to do it another day. I wonder why they need NRIC issue date as long as the NRIC number and Full Name is given?